Every year, it seems that we are fortunate to have work kamper volunteers to bail us out in the time of need. This year is no different. A couple weeks back, we received an email from Debbie Smith and Carey Kriger asking if we needed any help in ramping up for the fly-in. Unfortunately, they said they could only be here for 3 weeks and would have to miss the fly-in. That didn't seem right to have helpers working on an event that they would have to miss but they assured us that it would be a fun time for them and so they came to help out. Fortunately for us, Debbie is a glutton for manual labor and Carey has a knack for anything requiring mechanics or engineering. Currently we are introducing them to a rural lifestyle and they are helping us out tremendously. We'll be sad to see them go this week; but in the meantime, if you stop by and see them out slaving around the field, you might offer to take them flying or at least thank them for the long hours they have been working to help us make your event even better. Many of the Work Kampers we've hosted over the years have become long term friends and we know that many of you have also become friends them so we thought we'd give you an up date on two of the couples. A few weeks back, we had dinner with Pam and Kirk Wood (2005 season) and Larry and Sharon Hagen (2009 season). All are doing well! Pam and Kirk are still enjoying the work kamper lifestyle and have many interesting stories to share about their adventures. While, Larry and Sharon have settled down a little and purchased a small house about 45 miles away from us. 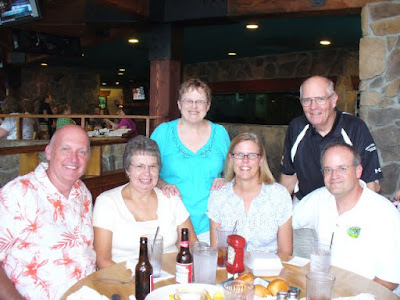 They still have their motorhome and enjoy traveling but they are now closer to the grandchildren and enjoy visiting with them as much as possible.